As a student tasked with learning all of the anatomy, physiology, and pathology of the human body, I sometimes feel I’m barely able to tell up from down. But I do know that I want to do good. I want to make people, patients, feel well. And from the biopsychosocial model of health that is by now all–too–familiar, I am aware that wellness is more than just being free from disease. As a medical student, I certainly identify with the above statement. But so does my colleague, a third year student at the Boucher Institute of Naturopathic Medicine. In fact, the above statement is an accurate description of both our experiences in our respective medical educations, as well as our motivations for choosing them. We both attended graduate school at Simon Fraser University, both working late hours by the benchside, cursing our cell cultures, and writing and rewriting our theses. It was after we finally secured our title as “Master’s of Science” that our paths diverged. The pursuit of a four–year degree that differs by one letter in the alphabet will have a profound impact on how we are viewed by society, the respect we are given, and the stereotypes we give one another. To better grasp this one letter divide and address the misinformation, I simply decided to ask them some questions and share with you the answers. How does the level of training compare between MD and ND? 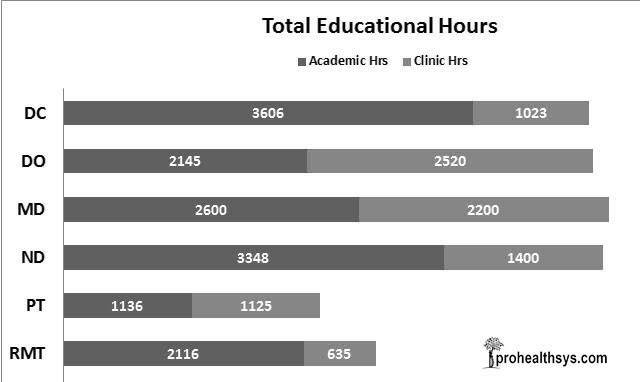 Figure 1: Total educational hours: a comparison of various health professionals Average total undergraduate (or equivalent) education hours of DC (Doctor of Chiropractic), DO (Doctor of Osteopathy), MD (Medical Doctor), ND (Naturopathic Doctor), PT (Physical Therapist), RMT (Registered Massage Therapist), LMT (Licensed Massage Therapist). Adapted from ProHealthSys. Following graduation, NDs are required to obtain continuing medical education credits each year as outlined by the provincial regulatory boards. This combined knowledge, experience, and skill allows us to differentially diagnose and treat patients with a wide variety of health conditions. Are ND’s against conventional medicine? No. Both naturopathic and conventional medicine have unique roles in patient care. Situations that require specialist–specific or emergent medical care go beyond our scope or level of expertise. In these cases, NDs recognize their limitations and choose to refer patients to MDs for collaborative management. When discussing the spectrum of care, NDs excel at optimizing lifestyle and health, preventing disease, and treating chronic conditions, whereas MDs excel in emergency and critical conditions. The area in between is ideally where NDs and MDs can work together to provide integrative, patient–centered medical care. What are some common conditions patients present with and what is an ND’s approach to treatment? As primary health care providers, NDs see and treat a wide spectrum of patients with varying conditions, similar to general practitioners. However, many NDs choose to focus their practice on more specific areas including, but not limited to, oncology, paediatrics, women’s health, and sports medicine. Regardless of their type of practice, most NDs treat patients with concerns related to gastroenterology, endocrinology, mental health (depression, anxiety), and allergies, primarily because of our extensive training in these areas. Though we treat chronic disease, as mentioned, our primary goals are emphasizing prevention and maintaining optimal health. No. A naturopathic doctor is a licensed medical professional who provides comprehensive patient–centered care. Naturopathic medicine and homeopathy are not synonymous, and unlike NDs and MDs who are licensed physicians regulated by the government, homeopaths are not doctors and do not have a regulated profession. Are all NDs anti– vaccine? No. NDs are not anti–vaccine, though as a profession made up of individual practitioners with their own thoughts and beliefs, there are a number of perspectives on the topic. The British Columbia Naturopathic Association (BCNA) does provide a position statement with regard to communications around giving vaccinations. Prevention is one of our primary principles, and vaccinations, proper hygiene, and adequate nutrition fall within that category. Our responsibility as NDs is to educate on the benefits and risks of any treatment, allowing patients to make informed choices about their health, vaccinations included. Are naturopathic practices rooted in evidence? I’m grateful to my colleague for answering my questions and providing a better insight into the naturopathic profession. I know, however, that these few pages will not be enough to mend the historically poor relationship between MDs and NDs. As future physicians, some of our patients will seek alternative care, and it’s at this critical point we must not let our personal or cultural biases sabotage our efforts at optimal and continuous patient care. Our methods and approaches may differ, but we are colleagues in healing and wellness, and in this spirit I encourage you to keep the dialogue open. Traditionally, students studying in Canadian medical schools receive limited exposure to the practice of naturopathy and other forms of complementary and alternative medicine (CAM). In this issue, the UBCMJ has sought to increase students’ awareness of CAM practices by presenting multiple opinions regarding their use. In this article, Csilla Egri, a third year medical student, interviews a naturopathic student and explores a number of common questions and concerns about this profession. The views expressed in response to these questions, as presented in this article, are solely those of the interviewee and do not necessarily reflect the ideas or values of the UBCMJ or the Faculty of Medicine. Please note that that the UBC Faculty of Medicine follows the Provincial Health Services Authority (PHSA) guidelines on vaccinations. Siedentopf CM, Golaszewski SM, Mottaghy FM, Ruff CC, Felber S, Schlager A. Functional magnetic resonance imaging detects activation of the visual association cortex during laser acupuncture of the foot in humans. Neurosci Lett [Online]. 2002 Jul [cited 2015, Feb 21];327(1):53‑6. Calder PC. Omega-3 Polyunsaturated fatty acids and inflammatory processes: nutrition or pharmacology? Br J Clin Pharmacol [Online]. 2013 March [cited 2015, May 13];73(3):645‑662. Kau AL, Ahern PP, Griffin NW, Goodman AL, Gordon JI. Human nutrition, the gut microbiome and the immune system. Nature [Online]. 2011 June [cited 2015, May 13];474(7351)327‑336.